Thanks to Farley from Oh' Boy 4th Grade I look forward to the beginning of the month because I know that it's time to fill out my CURRENTLY. 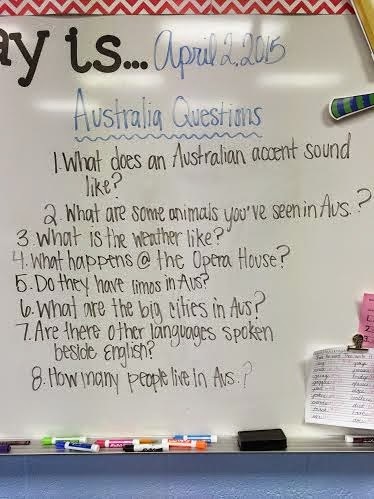 One of my 2nd graders has been in Australia for the past 2 weeks. Her dad is originally from Australia and they visit once a year during this time. Luckily for me their trip aligned perfectly with our "Our World Around Us" unit. Through the unit students are researching and creating presentations on each continent. Since my kiddo in is Australia, naturally she is presenting on Australia! Her dad had the awesome idea of Skyping while they're over there. 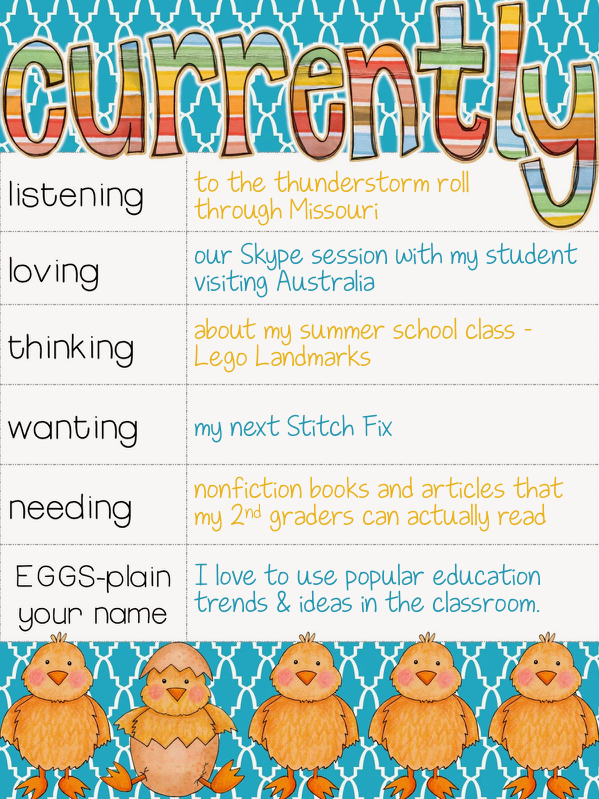 We spent part of our day brainstorming some questions to ask during our Skype session. My favorite question way about the limos. We asked, and in fact they DO have limousines in Australia lol! Then we had the opportunity to call them while we were at school. They made special arrangements to be at the Sydney Opera House for our Skype session. Our students LOVED seeing the Opera House and the Harbor Bridge in "real life" as they call it. This summer I am so exited to be teaching a 3 week enrichment course that I'm calling Lego Landmarks. Registration opened yesterday and our cap is 24. Unfortunately, if your class doesn't fill you don't teach it - so fingers crossed that my class fills so that I can start planning. In the meantime I'm looking for cheap Legos! Did you know how expensive Legos are?! Holy cow! So, I'm thinking maybe a Donors Choose project...but I'm not quite sure yet. Any other great ideas for getting my hands on some Legos? OH. MY. GOODNESS. I am obsessed with my Stitch Fix and my adorable stylist! If you haven't hear of Stitch Fix it's time to educate yourself. If you've heard of it but you're on the fence I highly suggest taking the plunge, even if it's just for one month. It is so much fun and a great way to get some quality pieces for your closet. I truly cannot wait for my next one to arrive! You can read about my most recent Fix and all of the goodies I kept by clicking here. Teachers are always needing more, am I right? Even working in a great district with TONS of resources I'm still always wishing I had more to meet ALL the needs of my kiddos. Right now we are in the middle of a nonfiction reading unit. Unfortunately it's hard for my 2nd graders to apply these reading strategies in a nonfiction book when they can barely read it because it's written at a level W! My goal for the weekend is to get my hands on some great nonfiction reads for my 2nd graders. Lame, I know...my name doesn't have an awesome back story. I knew that I wanted a catchy name when I first started blogging and I always considered myself to be pretty trendy. So, A Trendy Teacher was born. Read more CURRENTLY posts from other great blogs here. Your enrichment course sounds like it will be fun! Good luck with enrollment and I hope you get to teach the course. 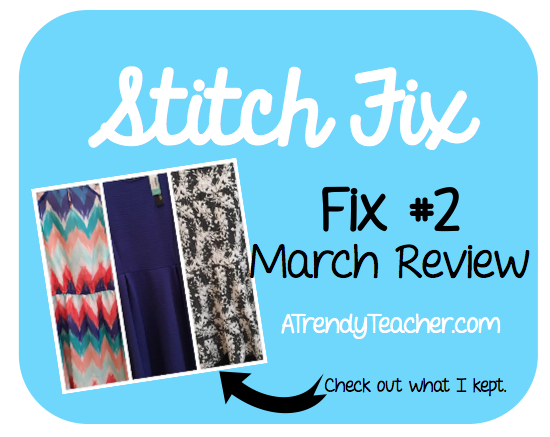 Thanks for the details on Stitch Fix! I've been seeing it on Instagram for awhile now and I think I'm ready to try it out! Good luck with your Lego class... I hope you get a full class! You will LOVE Stitch Fix, really! I'm so excited that you have decided to try it out. I'd love it if you'd use my referral code to register, you can do so by clicking HERE. Let me know if you have any questions at all, I'd be so happy to help you get started! What a great experience to be able to Skype with your student halfway around the world!!! Awesome idea! Your Lego Landmarks class sounds intriguing - I hope it fills so you can blog all about it! 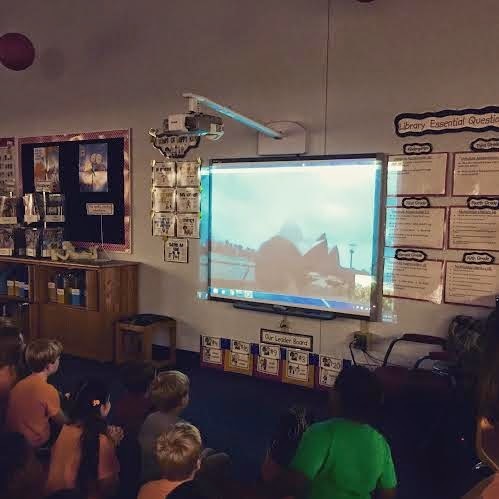 I love that you were able to speak with your student in Australia, I'm sure it will be a memorable school moment for her.